Need a Tech Detox? Pledge to Unplug. 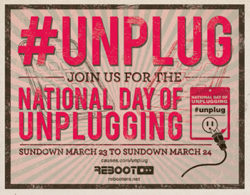 As a fan of the Idelsohn Society, we thought you may be interested in a project from our friends over at Reboot, the National Day of Unplugging. With roots in Jewish tradition, this modern day of rest was developed by Reboot as a way to bring some balance to our increasingly fast-paced way of life and reclaim time connect with family, friends, the community, and ourselves. The pledge to unplug begins this Friday, March 23rd at sundown. A 24 hour digital detox- no cell phone, email, texting, tweeting, or Facebooking. Instead, spend time with loved ones, go outside, give back, listen to music. Which is where we come in. To help you get in the mood, we’re making available a limited time download of Joe Quijano’s “Sabbath Prayer,” from the Puerto Rican percussionist’s Fiddler on the Roof Goes Latin (a future Idelsohn re-release). Click here to download before your digital detox begins. Sign the pledge to unplug here.